Carbon treble classical guitar strings are a great alternative to nylon strings with 80% greater density. This allows for a thinner string to have the same mass for a given string tension. Carbon strings are notorious for intonation issues, usually because the diameter varies so much over the length of the string. That’s why we reformulated our GPX™ Carbon Treble classical guitar strings for unsurpassed diameter accuracy. Laser micrometer technology ensures that Oasis® only packages “true” strings, enabling your guitar to play in tune from the first fret through the higher positions. Our new GPX™ Carbon Treble strings have enhanced durability, preventing the delamination or “shredding” common to so many other carbon treble strings. Performers say they play these strings for more than 100 hours before changing sets! 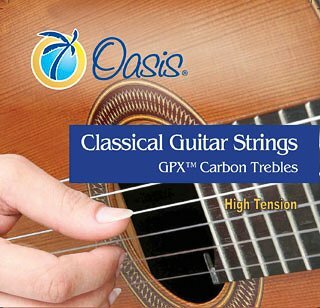 GPX™ Carbon Trebles are available as individual strings, treble sets (first, second, third string), or full sets with Oasis® Flex-Core™ bass strings in high, medium, normal, and light tension.